Okay, so this one is a little different. It’s an iodea I’ve had rattling around on occasion, so I took a stab at an iteration of it here. 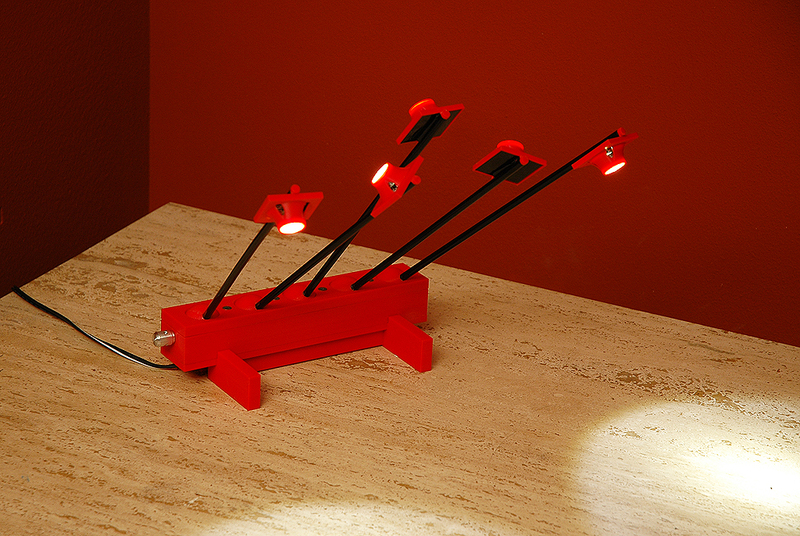 The idea is to have a little display light that can be configured to add a splash of light in a corner, to light a picture, highlight a table display, act as a reading light, and or all of the above. 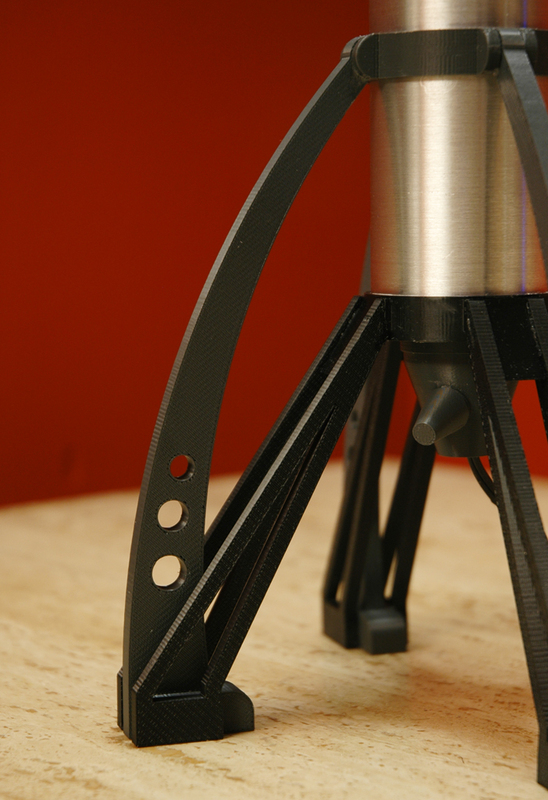 The base of each stem is founded in a ball joint allowing each stem to be tilted and rotated all over the place. Each of the heads has a little 25 degree reflector in it to direct the light from the LEDs, which ar Seoul Semi P4’s, 3000K, 90CRI driven at roughly 800mA. In the base is the driver and dimmer. 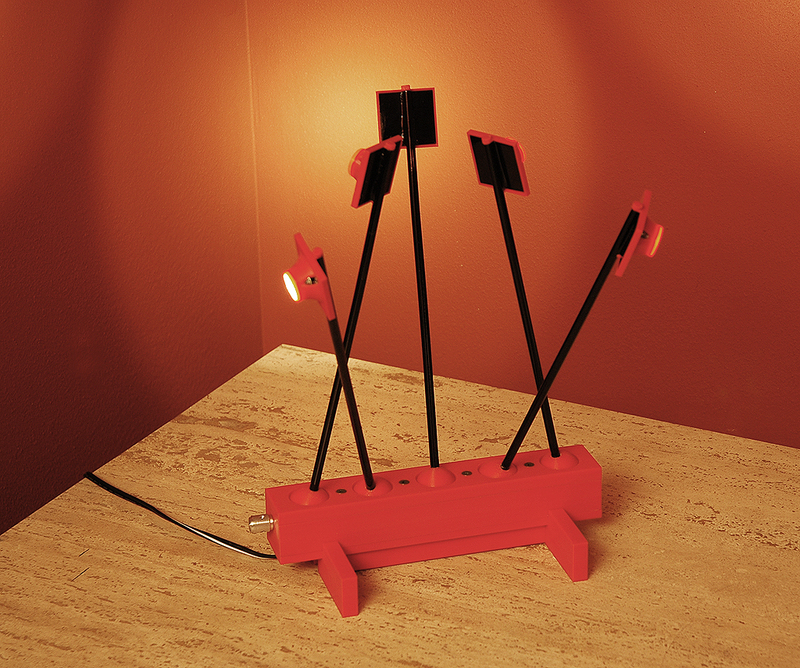 The stems and panel behind the LEDs are copper and act as heat sink. 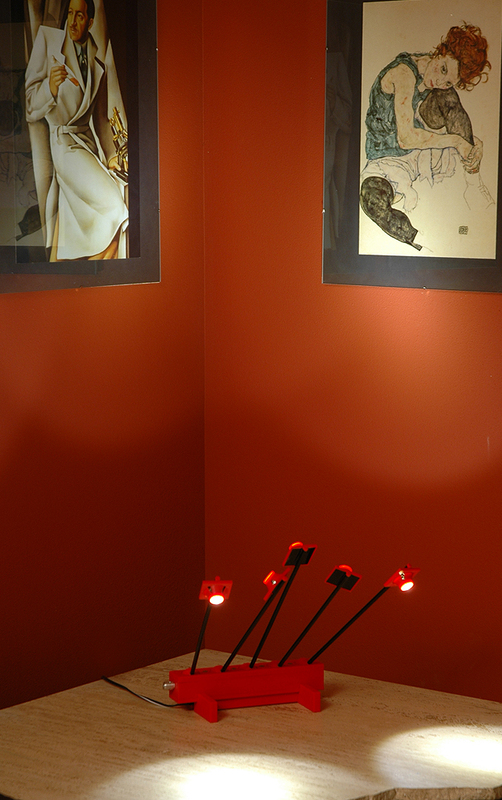 As the photos below show, arranging the lights changes the light character and the appearance of the fixture. Oh yes, this could esily be done in another color besides red. I just had the material on hand, and decided to use it. This would look nice in white or gray as well as black I am sure. 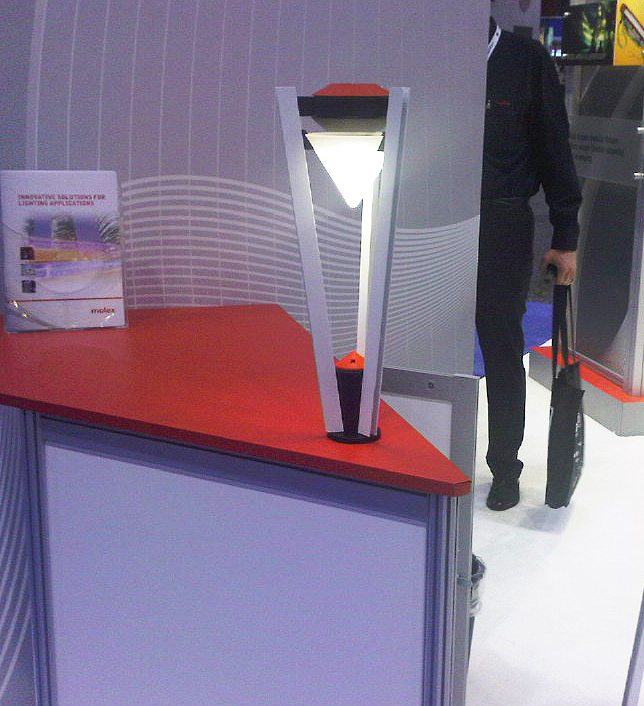 This design produces a really nice indirect lighting effect, delivering 30Fc on a wide area. I used White Optics reflective material (98% diffuse and 97% reflective) over an 800lm Bridgelux array, which includes a 32 degree Ledil reflector. 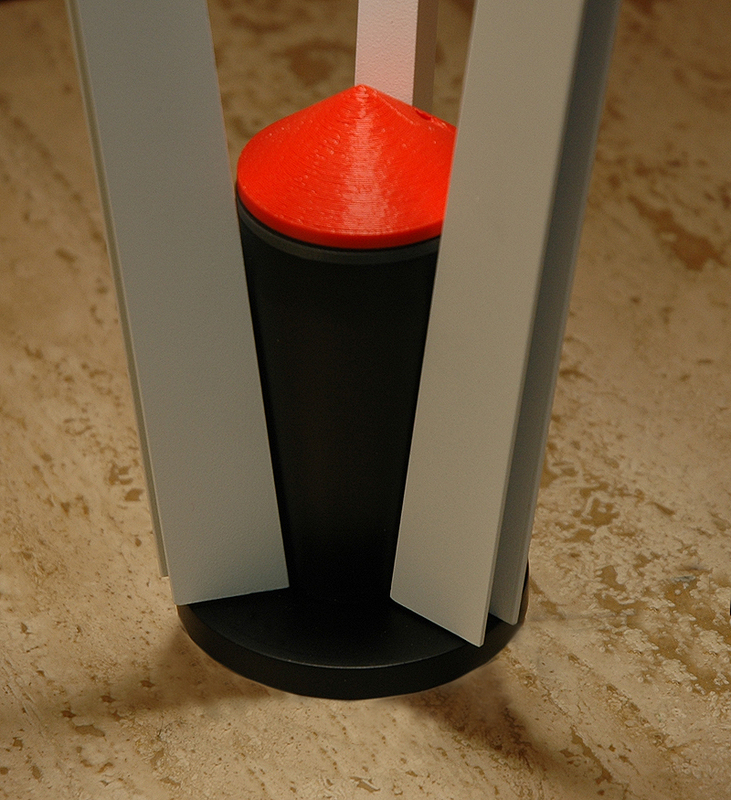 The main body tube acts as a heat sink, as does the mid section vent and LED heat spreader. At the base is the driver, and an integral dimmer control. There is also a thin wall baffle inside the upper section above the reflector, added after discovering a little glare issue. The design has a sort of rocket ship look to it. Originally the main body was to be powder coated white, but after brushing it to prepare it for paint, it just looked right, so I put it together sans paint (although I diod spritz the bare aluminum with clear to keep it looking its best. The structure is total overkill. But I like the combination of curved against angled sections, including lightening holes for effect. I was surprised at how well the white optic panel works, producing excellent light output over a very wide area with no undesirable brightness. I was also surprised that some light actually passes through it, allowing the upper panel to have some deliniation besides just shadowed. I call this one the Unicyclist. The balance beam arm and center open wheel remind me of days long ago when uni-cycling was one of my passions. Even after decades since riding regularly, I can still get on one and ride away. Takes a little to get the trick moves back, but they are still there. 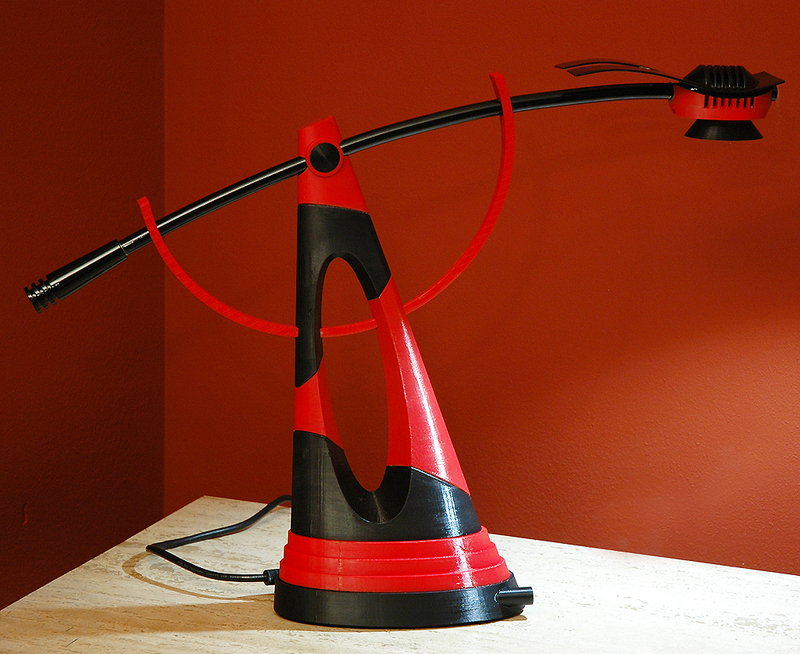 In any case, the body of this task lighter is ABS plastic, and houses all of the electronics. The arm is aluminum, thermally bonded to the solid machined copper head with wind-wave fabrication that extends the surface area. 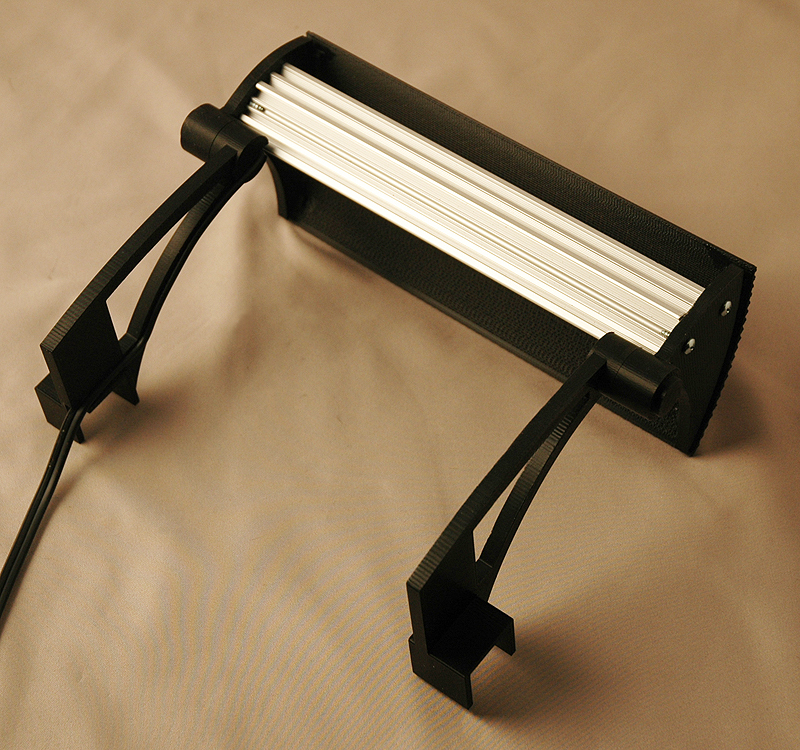 The LED is a Bridgelux 800lm array in 4100K for a change. This deliver over 140Fc on the task when at full on. 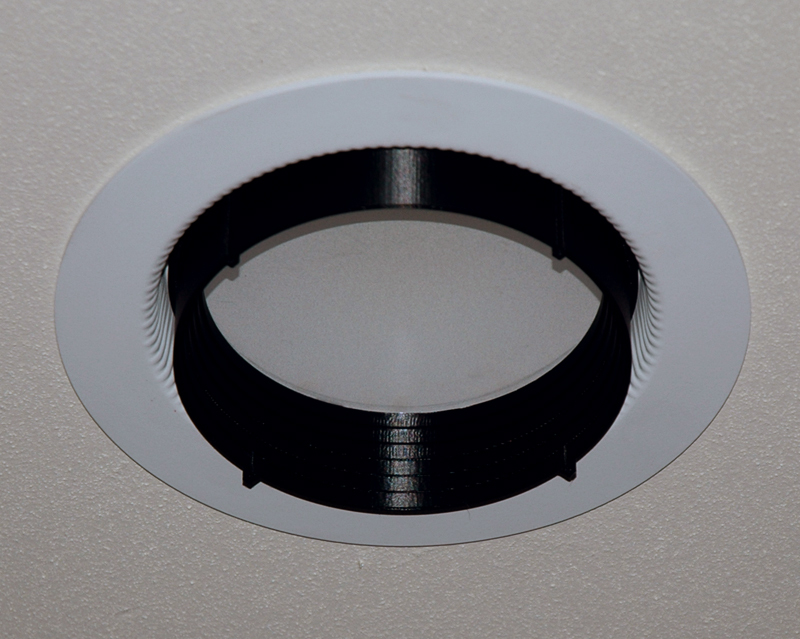 There is a dimmer control integrated in the base as well. With Lightfair eating next week, I wanted to get this off the bench before I got on the plane. Just made it. 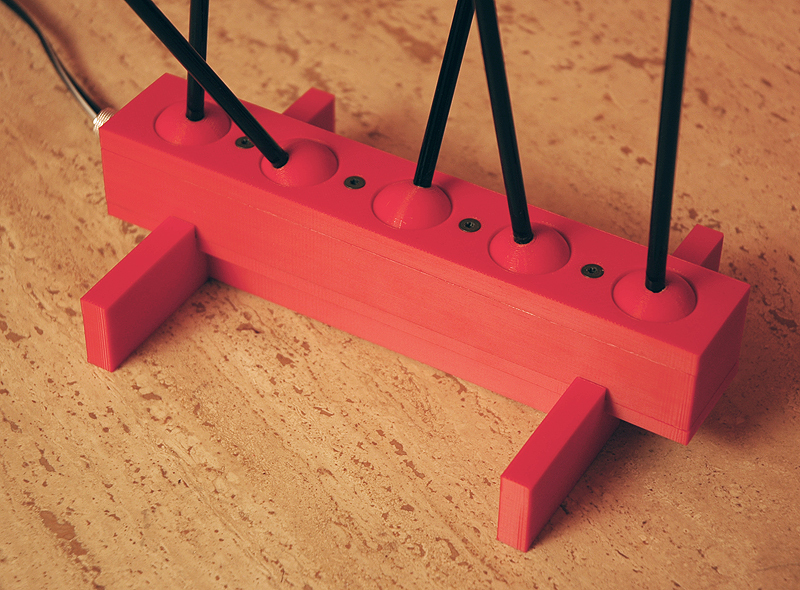 Design eighteen is already started, just missing some parts to make it work properly. More on Design Seventeen can be found at the Lumenique site. Teaching new dogs old tricks. While LEDs are great stuff for optimizing the use of energy for generation of light, they are not immune to the issues of brightness and glare. 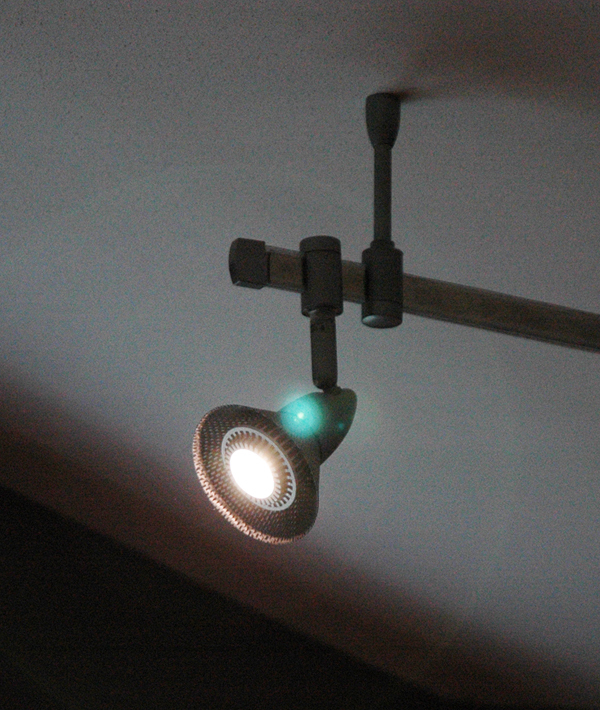 In application, some of the newer LED products are downright glare bombs. In the over-zeolous pursuit of maxing out efficacy many of the most efficient products get that from lack of optical control. This is great for by-the-numbers evaluation, but can result in some pretty ugly field conditions. 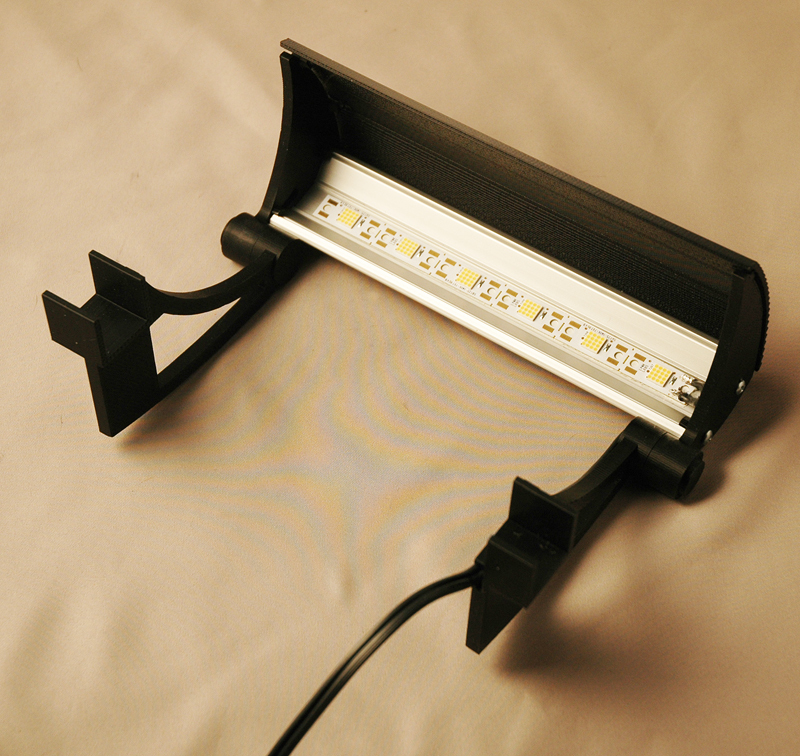 Other source using LEDs, have small luminous source areas delivering high light output. The result is an offending brilliance for those unfortunate to be in their focal path. This is an exercise in taking a couple of these new LED dogs to training camp and applying some old tricks to resolve their issues. Since most LED lights and retrofit lamps are configured differently than the conventional sources they replace, grabbing off-the-shelf parts to apply is rarely possible. 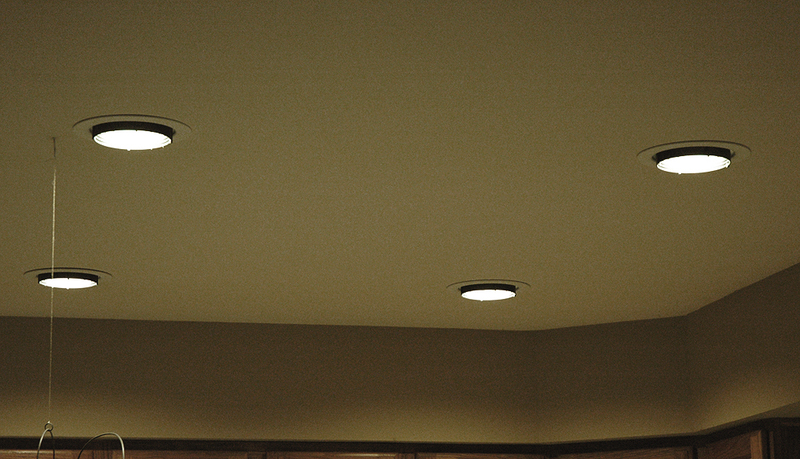 The combination of luminaos source area, orientation, and package dimensions means fixing any glare issues requires an equally unique approach. This is but the start of a process I intend to pursue, one source at a time if necessary. For those sensitive to source brightness and in many applications where the proximity of the occupants is such that the aperture of the LR6 is close in hand, their can be a serious issue of glare and brightness. This is the result of this products overly wide distribution and field angles, often promoted as an attribute in generating high vertical surface illuminance. I appreciate the product, and the pitch, but… after living with the LR6 for two years now, it became so much an issue that we stopped turning them on to avoid them. The issue is that any time the viewing angles are shallow, the apparent brightness of the lens in the LR6 is, to put it bluntly, offensive. 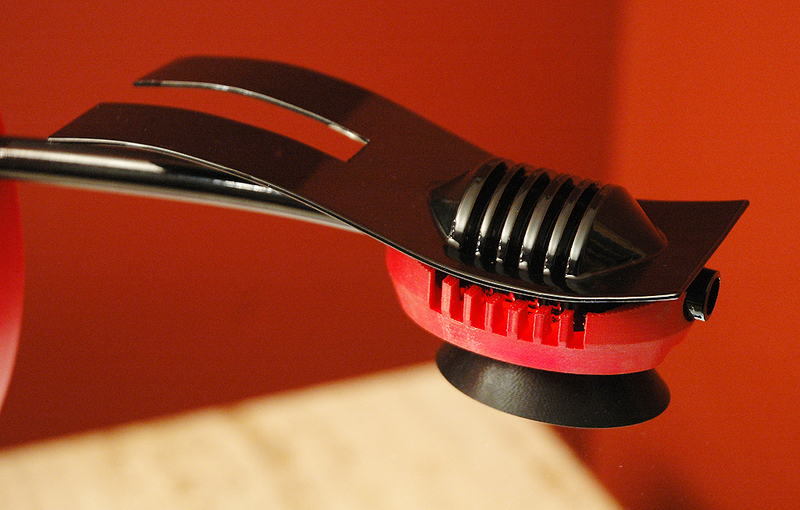 Even with the Cree accessory lower trims, the brightness from the too-shallow trim and exposed lens is unattractive. The approach taken was simple. First, by encroaching on the lens perimeter a very small amount (about 3/16″), and increasing the depth of the baffle itself, I eliminated the high angle brightness. All light above 25 degrees is simply blocked off. 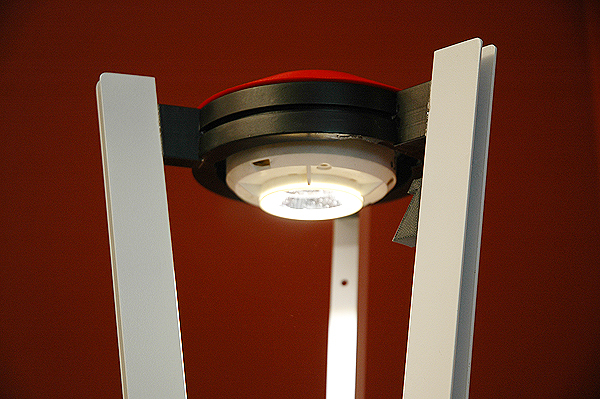 The effect on illuminance in the desired lighting zones below was imperceptable, and measured less than 3% less than no trim at all. I feel the result is a much more comfortable and attractive lighting effect. More can be found at the Lumenique site for Design Sixteen as well. 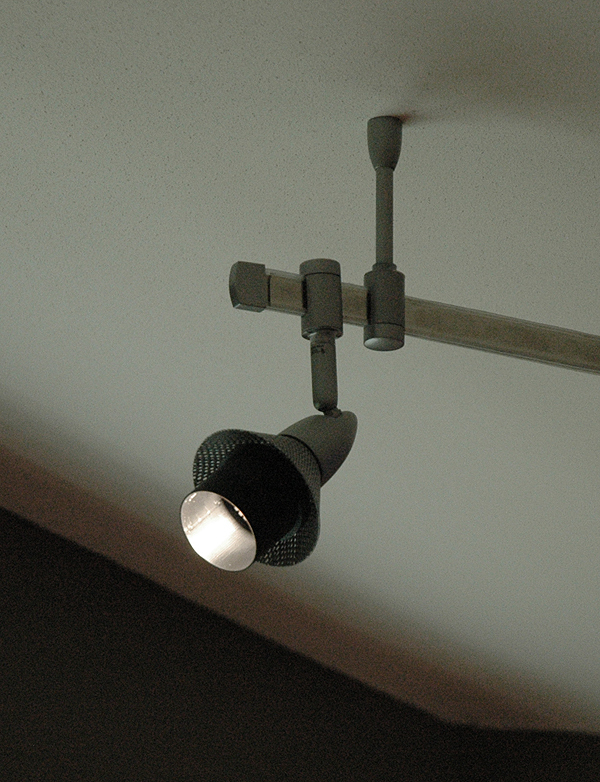 The LR6 without trim or baffles produces very high angle brightness than can be offensive at many viewing angles. 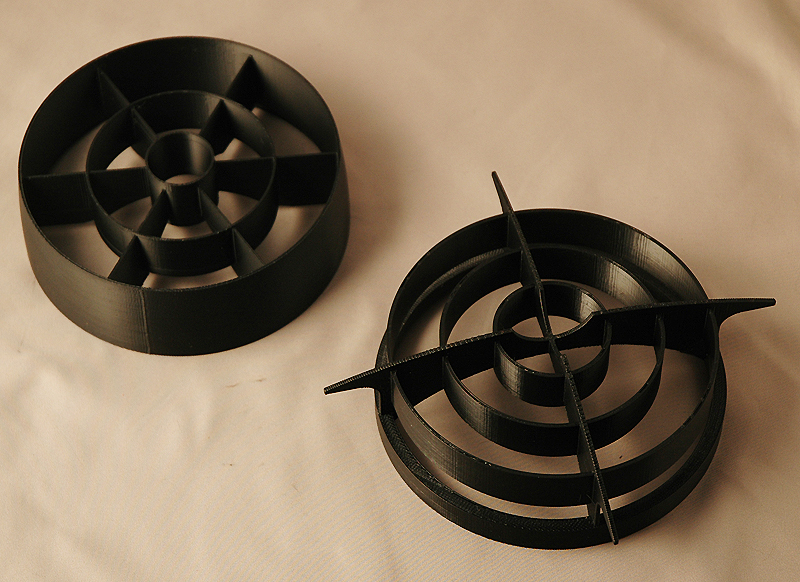 In the process of experimenting with various approaches to control the brightness from the large source area of the LR6, I also tried some louver designs, like were once used on big R40 lamps, which have the same problem in shallow housings. While these were even more effective in controlling brightness, the loss of total light output was more than I felt necessary. However, in some applications, these may be an even better solution. 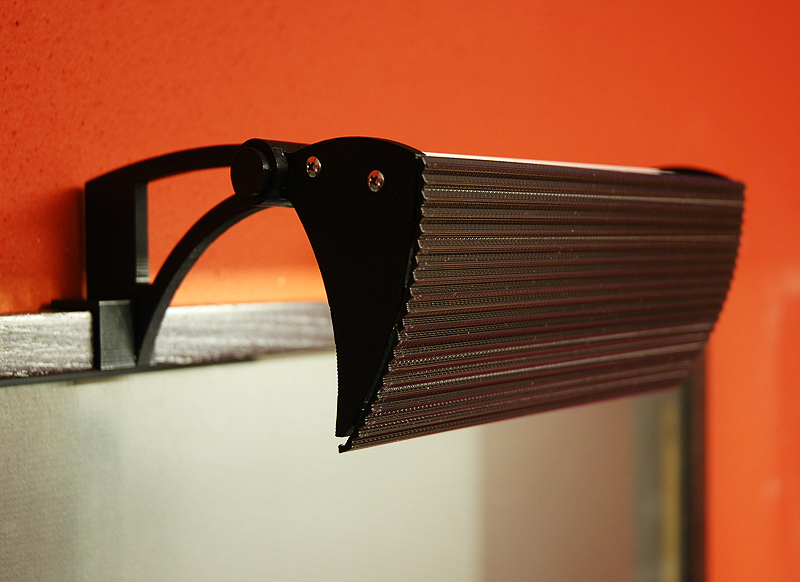 These louvers will be familiar to anyone who has done a church using R40 or R56 lamps. 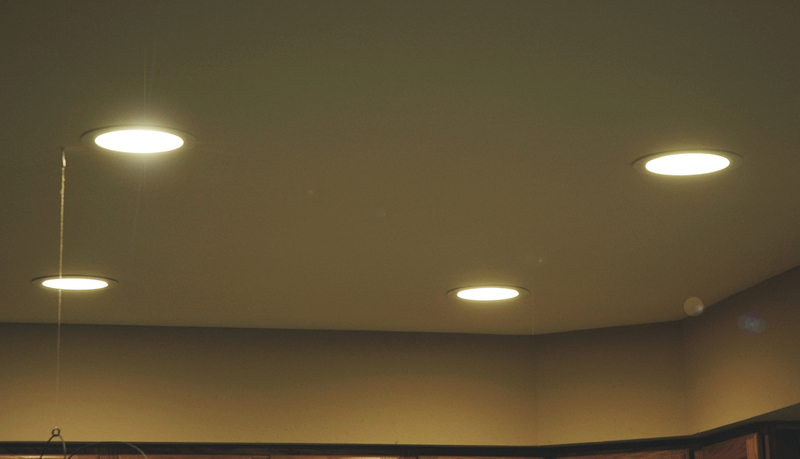 They do a great job of brightness and glare control, but impose a loss of light that is not always desirable. 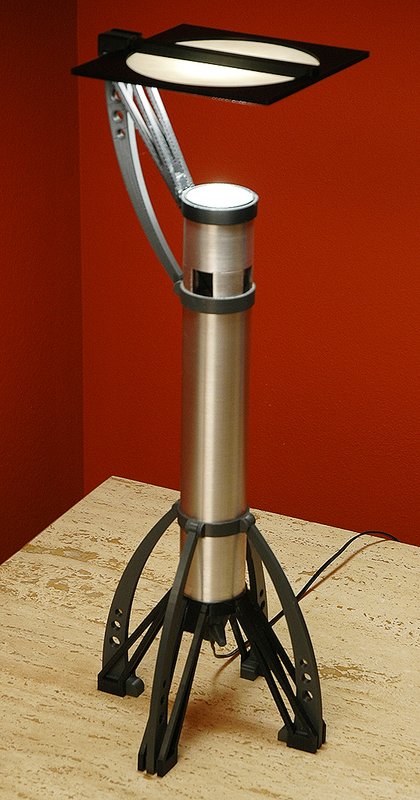 The MR16 lamp has always been a little glare grenade. LED versions that make enough light to be considered viable replacements, like the ones here from LEDengine, are just like their halogen forebearers in this regard, and worse. With an optical source size of just 1″, the brightness of the source is really offensive. To avoid cutting into the light pattern, while creating a reasonable cutoff takes a little effort in working out the geometry of a very simple and familiar snoot. 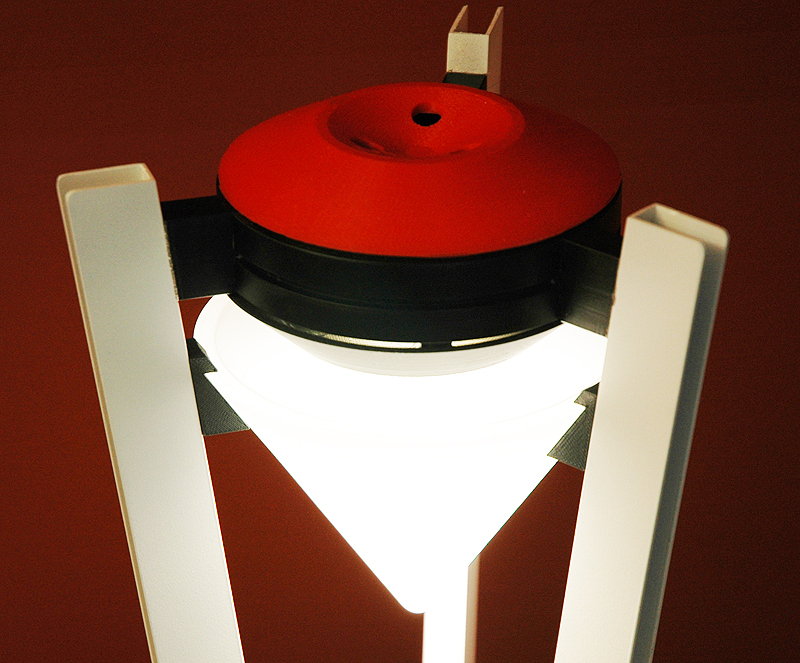 Further, since most all retrofit lamps have their own geometry and rarely match conventional lamps, mounting standard MR16 accessories is not an option. The snoot here cuts off all light outside 45 degrees from the furthest edge of the light source. However, the design is also wide enough not to cut into the beam pattern, so applied light levels are not effected. The result is an elimination of glare from most vieing angles, just as this approach has done for halogen lamps of the past. 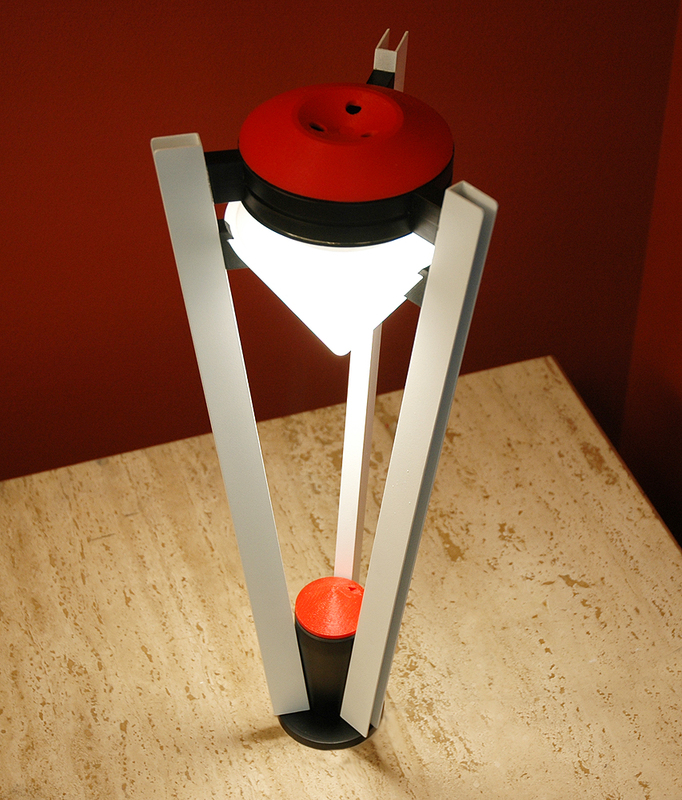 The brilliance of an efficient LED optic can be offensive and distracting if left uncontrolled. 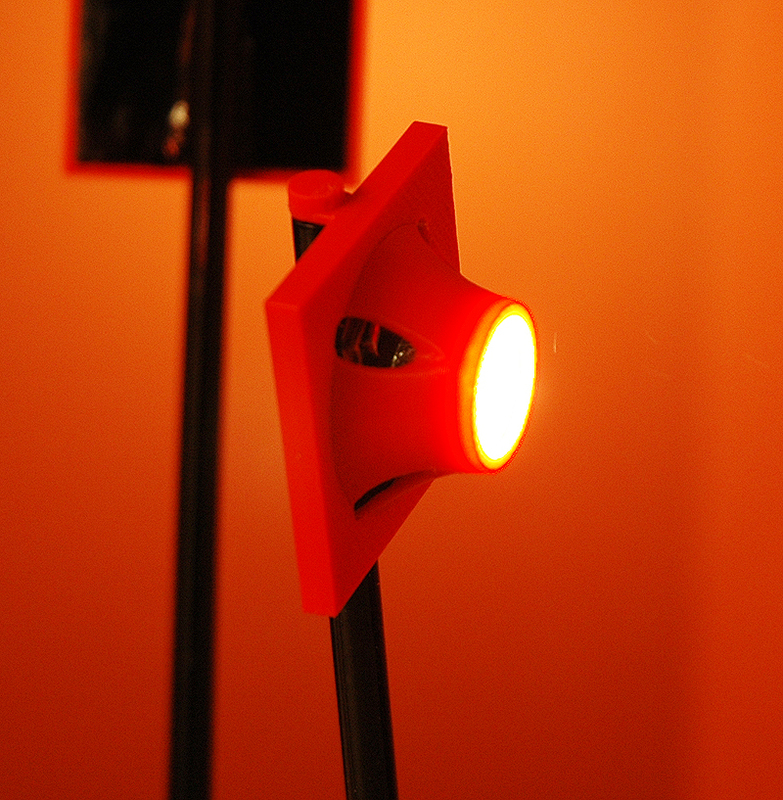 The snoot cuts off light outside 45 degrees, eliminating the visibility of the optic, yet retains the main beam angle and most of the field distribution, so lighting effect is the same, just more comfortable to live with. 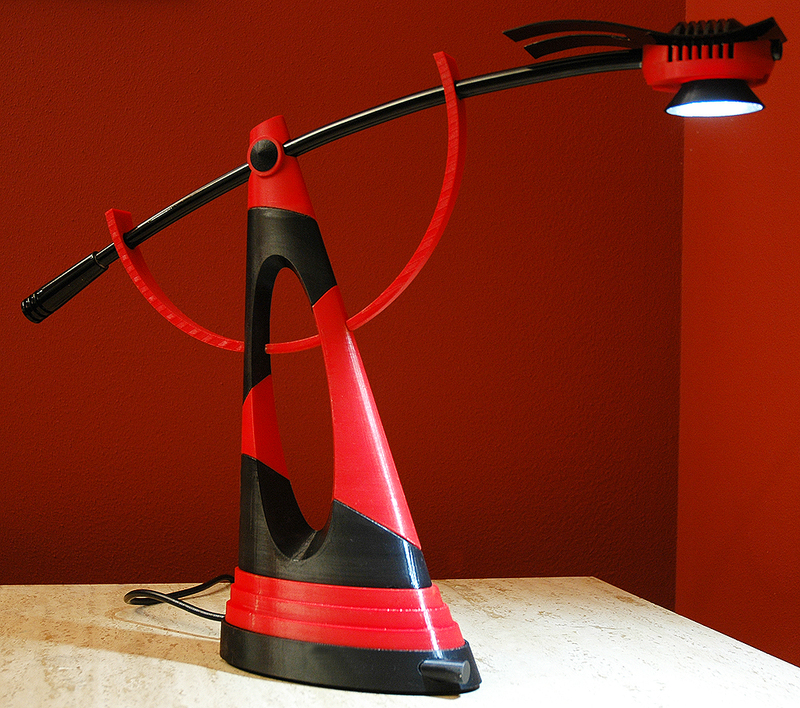 Not a new approach, just one designed specifically to this lamp. 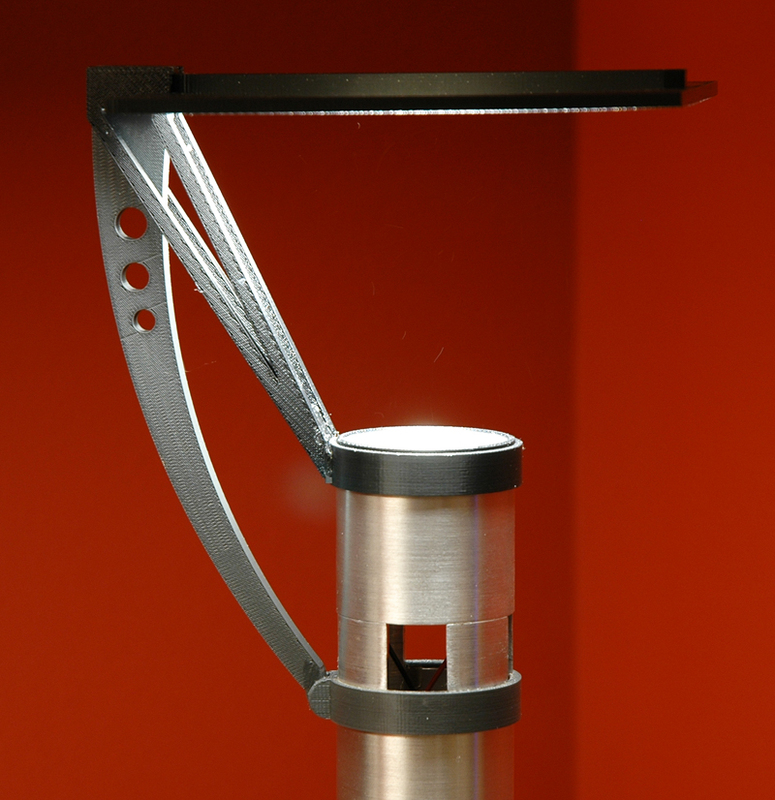 Unlike the standard halogen lamp, every LED retrofit lamp will need tweaks to the design to suit its unique geometry and optics. 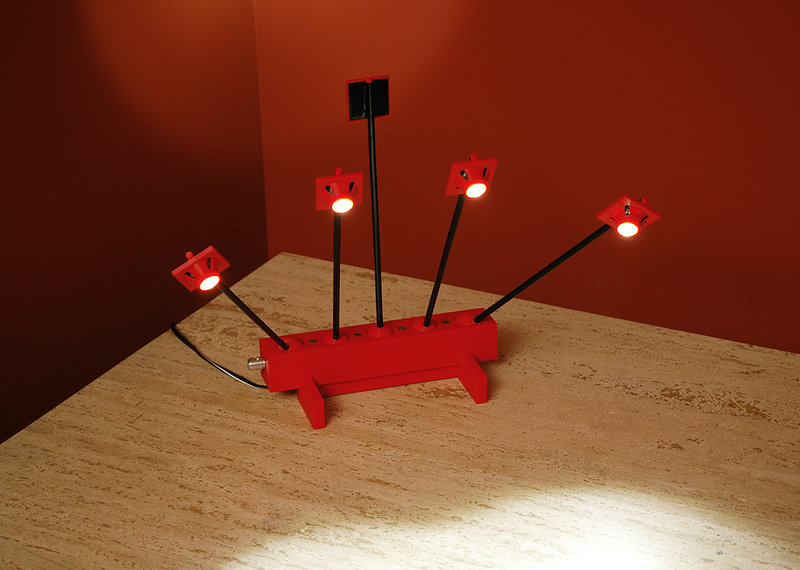 Picture lights have been a tool of lighting designers forever. The issue is, most picture lights do a poor job of controlling the visibility of the light source, while all of them are awful at controlling light reflected from specular glass used in framing of art and photos. This is a complex issue, that requires some very careful considerations of viewing angles, which means there is no uniform one-size-fits-all solution. 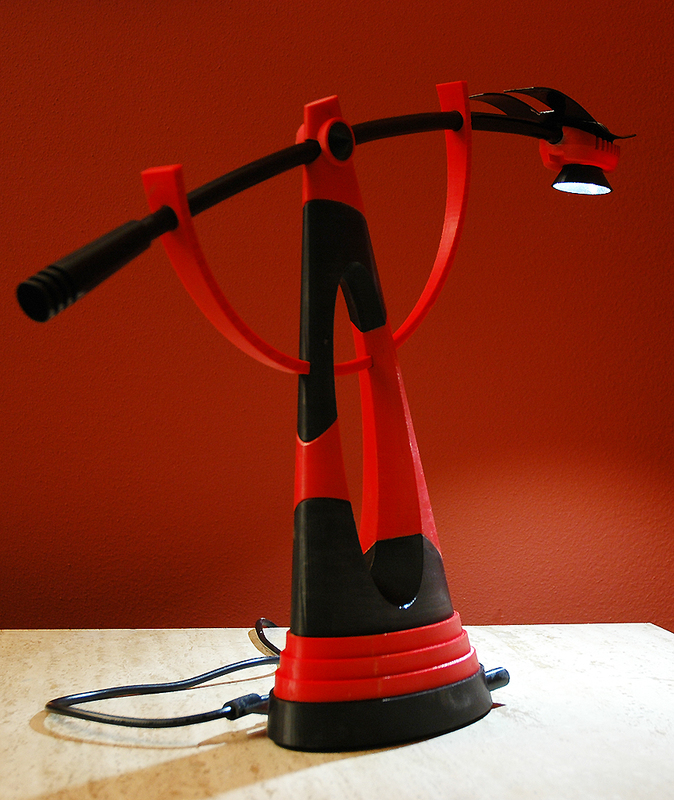 The picture light here attempts to resolve all of these issues, while being a decorative element in a contemporary design space. 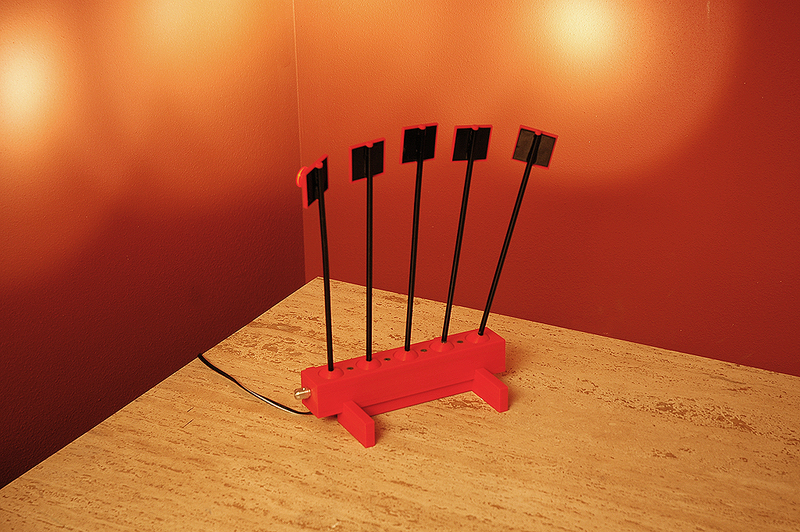 This design utilized LynkLabs Snap Bright 12VAC LEDs with a reflector heat sink combination. 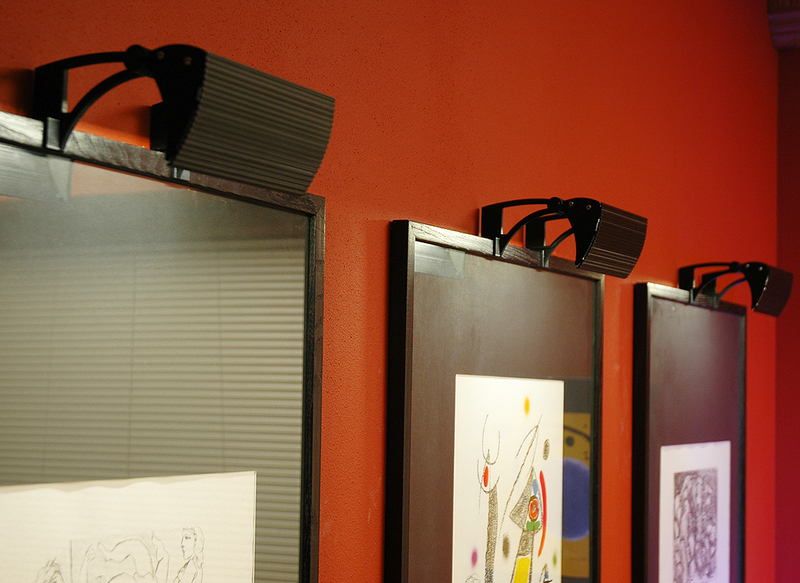 The front shield cuts light off at the bottom of the frame, blocks visibility of the light source from the observer side at all angles, and is designed to eliminate the visibility of the light source in the specular clear glass used to frame the art. 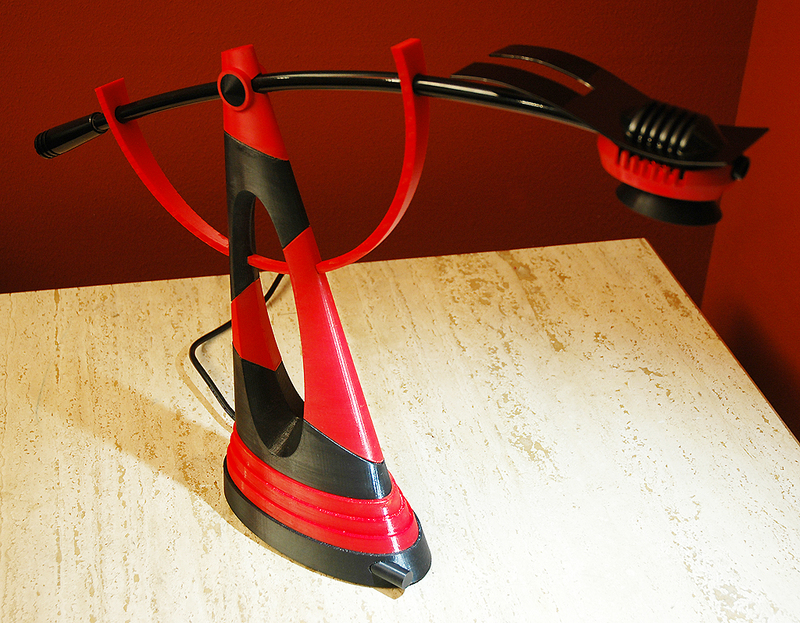 The lights clip onto the frame itself, while the wiring is concealed in the bracketry. 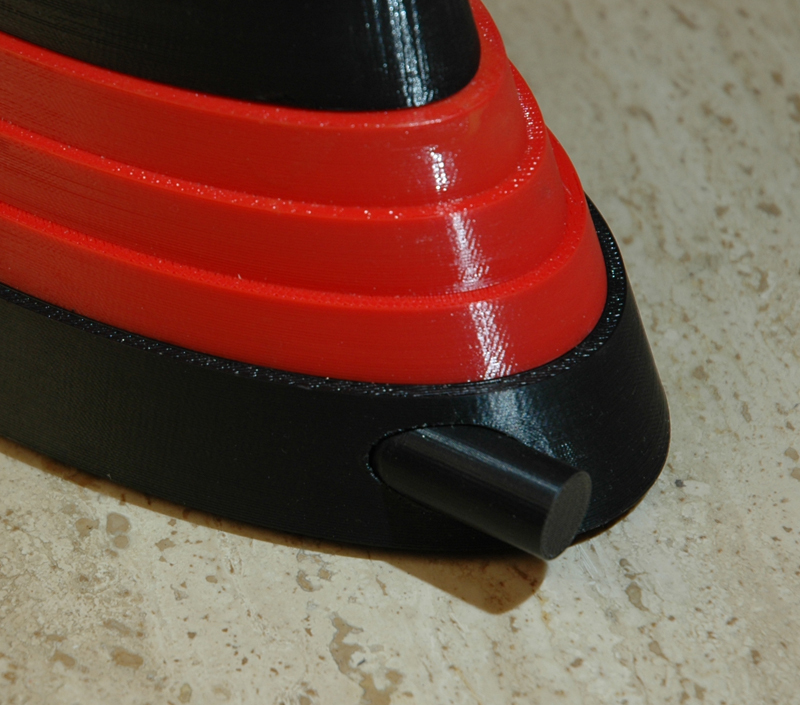 The ribbed face plate has no real function, other than add a texture. On frames, the intent was to produce a sort of clip-board appearance. 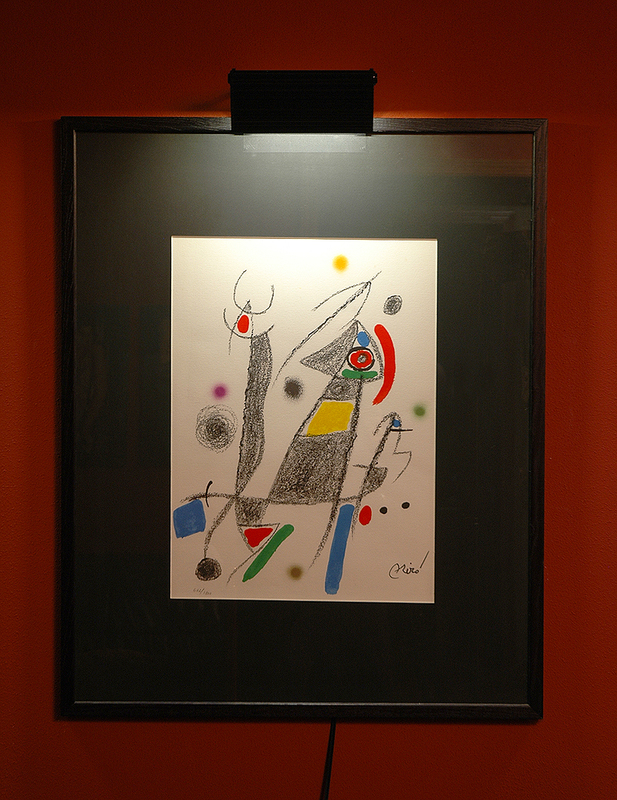 The art in this case are real Miro and Picasso certified prints in frames using UV filtering glass. 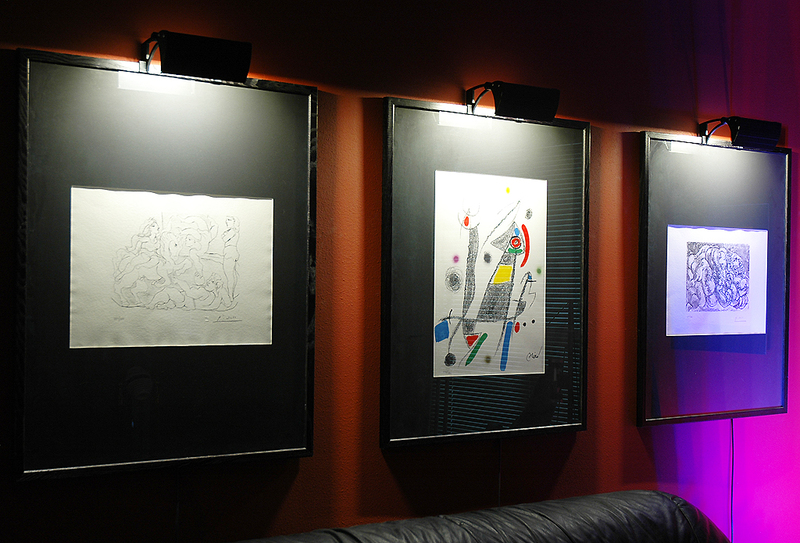 The images below show several views of the lights in use, and details of the design front and back. With a short break between shows and travel, it was nice to get back into the shop and make something of my own again. Designs 14, 15 and 16have all been in various phases of completion. 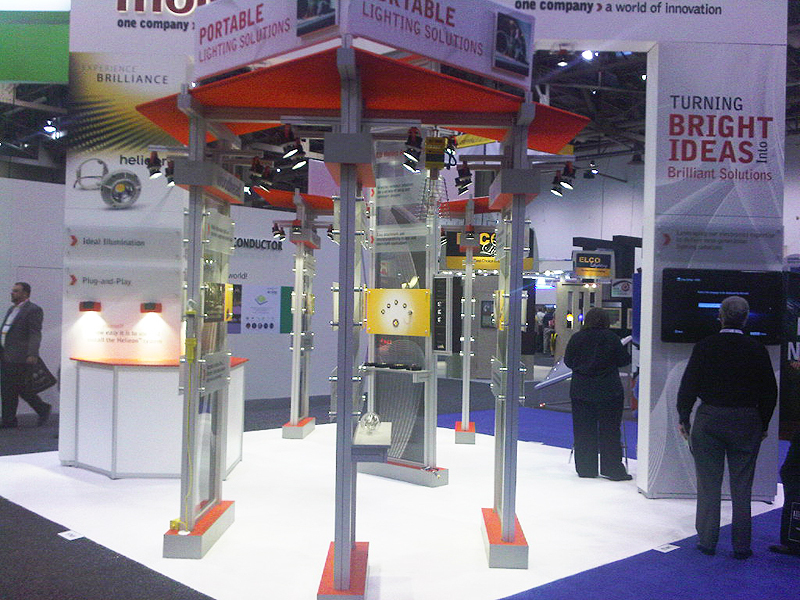 What you see here is D14, which came first to meet the deadline for Lightfair. 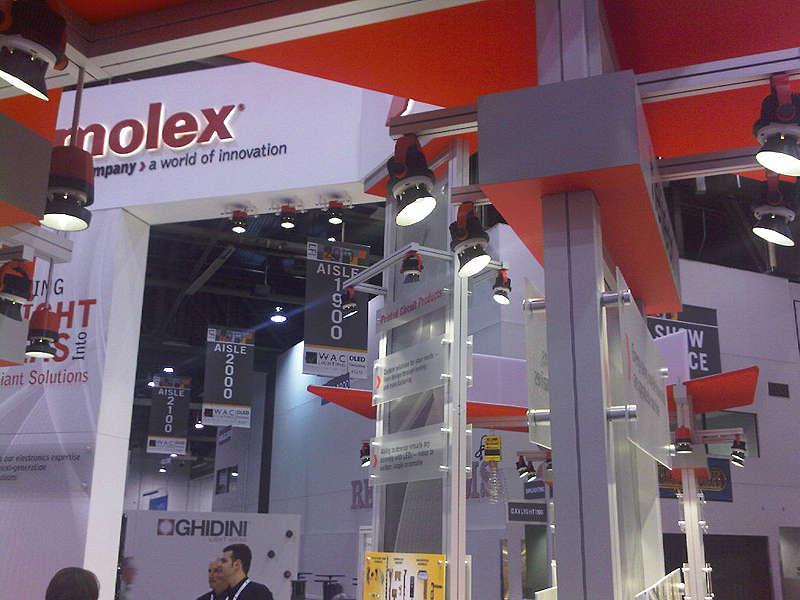 This design was commissioned for the Molex Lightfair 2010 display for the main entry desk. 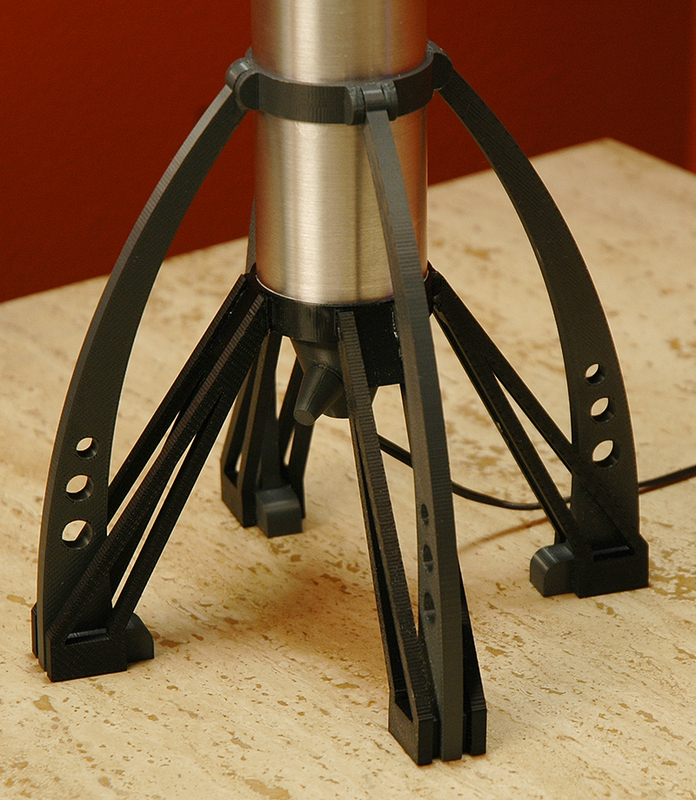 It bolts through the table top via a 1 1/2″ dia. hole. 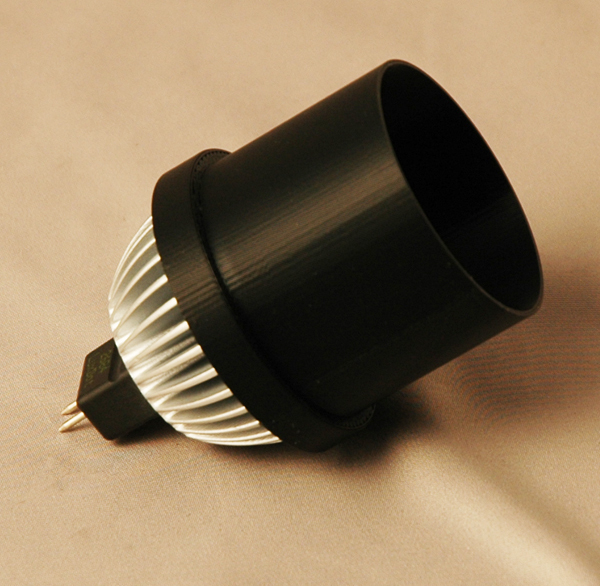 The 1A driver is located in the base, where the conical knob controls dimming. At the head, the m1200lm Helieon module is recessed into a machined housing/heat spreader, which includes thermal vias that allows air to pass by the module through the machined head, and lout the top cap. The head machining and support arms are thermally bonded to the vertical wings, so it all gets into the thermal control act. As a result the module and head run comfortably at 55C. 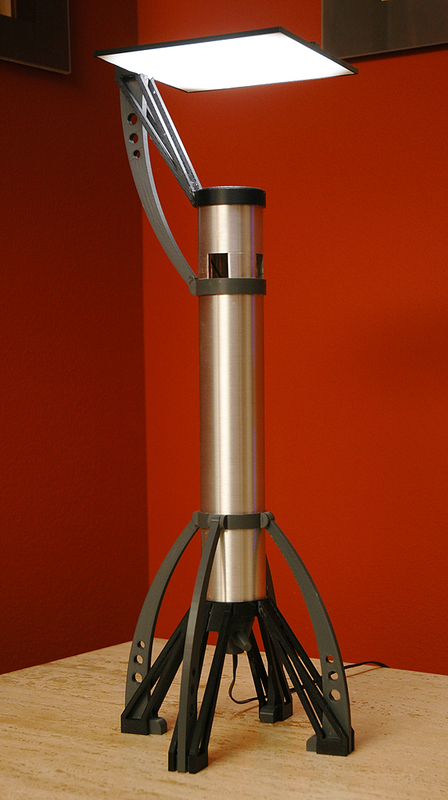 The module is trimmed with a gray cover which holds a prismatic diffuser to fill the glass cone with light. 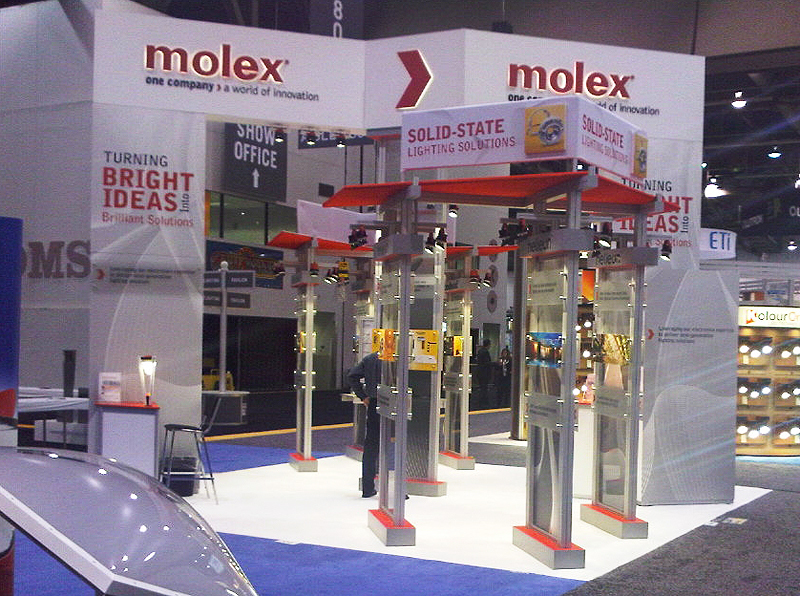 Drop by the Molex display and take a look. 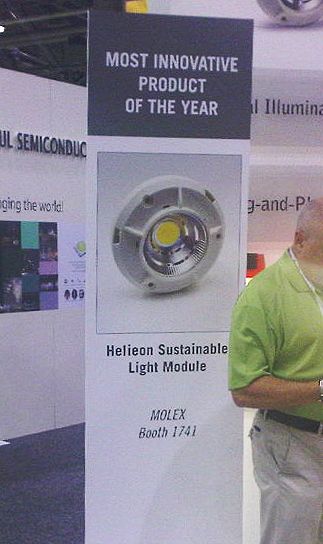 Not just at this light, but at the Helieon module. It’s all a neat bit of kit, and something I’ve enjoyed participating in the development of. For more on the module inside visit the Helieon web site. 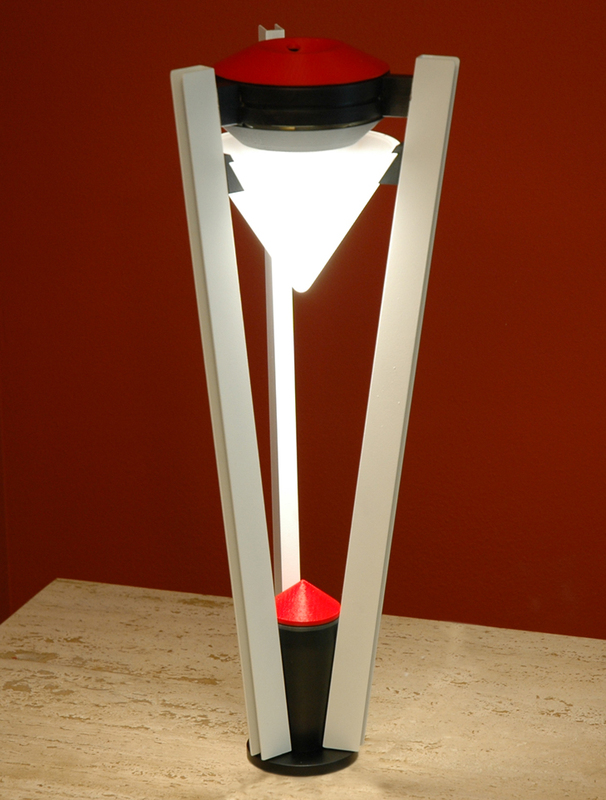 This is the shape of things to come in sustainable LED components. I’ve also put together a short article on the coming age of the SSL module on SSL Interactive. 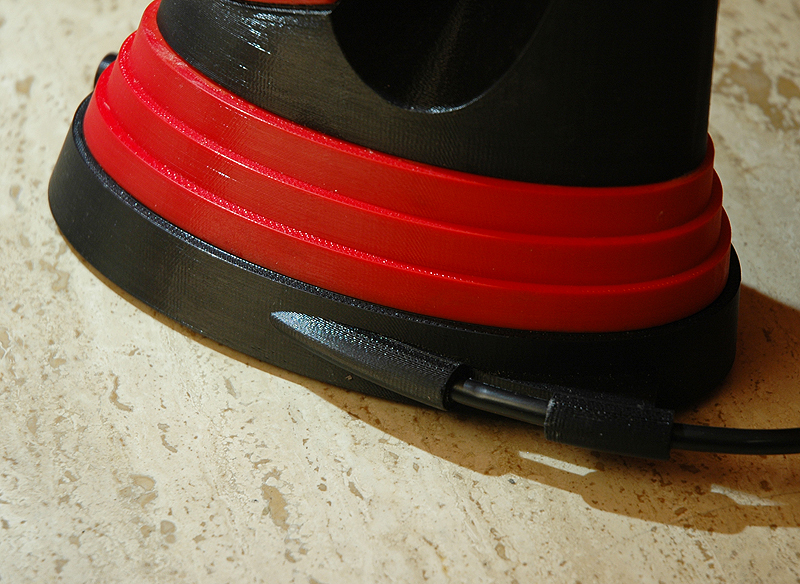 Design 15 thru 17 will be finished soon – So, please stay tuned!